In the front row from the left are Sophie Shurter, wearing the Santa hat, Katrina Wallace, and Julie Allen. In the back row are Mallory Upcraft, Allyson Bruns, Allison Vincent and Alynne Klumpe. The troop leaders are Janette Vincent and Amy Evanchik. 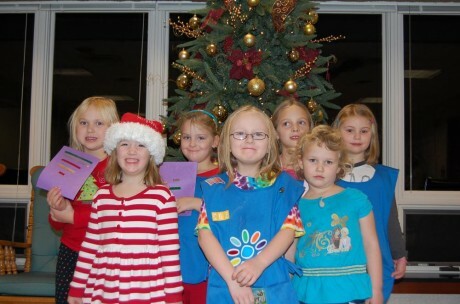 Members of Daisy Girl Scout Troop 566, of Minetto, recently visited The Manor at Seneca Hill. Members of the Troop made more than 40 cards that they delivered to residents on the second floor of the skilled nursing facility.